"When I’m training, I need four things, a room, a bed, and maybe two blankets, for when it gets cold." - Said Saaeef Shaheen from a must-read article by Pat Butcher. Shaheen is quoted by mentor Renato Canova, who goes on to say of the Qatari (formerly Stephen Cherono of Kenya): "Unlike many of the Kenyans, he is able to focus when he is in full training. The sign of a good athlete is how they spend their free time, most of them don’t have enough rest... That’s the big difference. It’s the ability to be tough with himself." Watch one of the greatest steeples of all-time here. *LaShawn Merritt Updates Us On His Progress This Year He and Jeremy Wariner both opened up with 44.mid this year. *Britain's Jessica Ennis Excited After Big PR In Heptathlon She's looking to podium at worlds. *Dutchman Bram Som Back Running Well With 2:19 1000m 1:43 Guy. *Elva Dryer To Run Freihofer's Run Freihofer's has one of their best fields ever lined up. *Get To Know Aussie Intermediate Hurdler Tristan Thomas He's blowing it up this year. LRC Week That Was We start off our recap with some sentimental stuff before analyzing the super GP in Doha and the Oregon 4 x Mile attempt. Along the way, we ponder whether Eliud Kipchoge is the most underrated runner in history and we also definitively answer who is the greatest 4 x Mile team in history - 2009 Oregon, 2005 Michigan or 2002 Stanford? Plus we even talk about a 6:22 marathoner and the inspirational story of two guys you've never heard about, Mekubo Mogusu and Sho Kimura. *From Kenya Kenya's Coach Kirwa Calls On Young Athletes To Be Consistent Kenyan sprinters are starting to emerge, one clocks 9.9 hand-timed 100m on basically a dirt track. IAAF Recap Of Sensational Meet That Produced 13 World Leads! The 2009 pro season got underway in unbelivable fashion as the first big 1,500 of the year produced two times that surpassed the yearly lead from 2008 as Haron Keitany and Augustin Choge changed the lead 3 times in the last 10 meters. Keitany forgot to lean and Choge got the win. The men's 3k was unreal as 6 guys, including Saif Shaheen, ran sub-7:33 but the winner in dominating fashion in 7:28.37 was Olympic 5k silver medallist Eliud Kipchoge. And the men's 800 may have been even better as the dual between the 19-year-old sensations lived up to the hype. (Soon-to-be) Olympic 1,500m champ Asbel Kiprop ran 1:43.16 but LOST to Abubaker Kaki's wire-to-wire 1:43.09. 2004 Olympic champ Ezekiel Kemboi threw it down with a sub-8 steeple to start the year (sick). Plus Travis Padgett won the men's 100, Allyson Felix the women's 400, and more. *Given His 1:43 Opener, Can Olympic 1,500 Champ Kiprop Get 1k World Record? Pat Butcher writes about a man who left Kenya for Qatar so he could speak his mind, outdueled El Gerrouj in the Moroccan great's first 5k, and ran 7:53 for the steeplechase all in the summer of 2003. Butcher provides a deep look at Shaheen's toughness that you won't find anywhere else, including his reaction to running 7:32 in his return to the track (where he was defeated by several Kenyans). Watch Shaheen race Ezekiel Kemboi at the 2003 World Championships - One of the greatest steeple races, if not the greatest, of all time, with fantastic commentary. 1. Adidas Track Classic Startlists Just check out the events and you'll see it's a great meet. 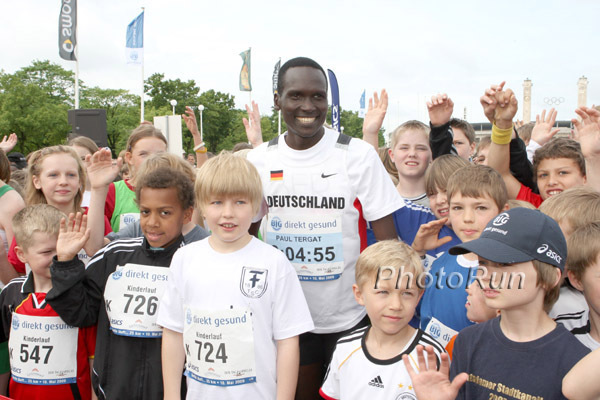 *Paul Tergat Misses Big Berlin 25K After Training Injury, Still Has Fire In The Tank He says a sub-2:00 marathon will never happen, that 2:02 is virtually impossible. *Oregon's McKay High Graduate Ryan Bailey Runs 10.06 For Rend Lake College 6th-best in the world this year. *Writer: Valerie Vili Worth Paying For To Remain A New Zealander She's only netting 40k a year and pouring $160k into keeping her career going. *Changing Tunes: Reports Say Blanka Vlasic Will Compete Full Golden League Schedul Maybe she wants to get the million this year. The best high jumper of her era failed in her final golden league meet, came up short at the olympics, and fell short again at the European Indoor championships! *Scolded WADA To Release "Enhanced" Wherabouts Rule As European Countries Threaten Funding Withdrawal WADA's finally met its match: funding cuts! *Pointless: Dad of Bumped Fan Wants Big Baby To Apologize He did apologize and for that we give him a classy thumbs up. Golden League Controver$y: Vlasic And Other Top $tars Considering Berlin Boycott Vlasic, who barely lost out on her share of the Golden League Jackpot last year, is considering removing herself from the competition this year as it looks like Berlin is hurting for funds to pay the stars their appearance fees. Ducks Get Collegiate Record, Miss 16-Minute Barrier A raucous Hayward Field crowd ringed the track and pushed Oregon to the collegiate record but they missed the coveted 16-minute barrier. 3:59.53 for Centro, 3:59.60 for Wheating, 4:05:21 for Biwott, 3:58.93 for Rupp. *Message Board Thread The thread suggests this should be a yearly event. It is; it's called the Penn Relays. Adam Goucher ran 14:00 in the 5k and Jesse Williams high jumped 2.34 in other action.